As I sit down to write my September blog, it is obviously apparent that it is a little later than usual, for which I can blame Horse of the Year Show for coinciding with my prime ‘blog writing’ days. Although I am yet to compete at ‘the World’s most famous horse show’ myself, I made the trip to Birmingham’s NEC three times in order to support the classes I was most interested in, catching up on missed lectures in my free time. September was a quietly fantastic month for me and for Avonbrook Stud. The first big outing was to the British Arabian Championships with Annia Aurelia – Penny (Marcus Aurelius x Bint Zaehaebi) for her final show of the year, where she contested the ridden mare championship class. 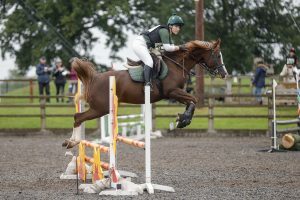 I highly enjoy the format of the championships and its location at Kings Equestrian Centre in Bromyard fulfils the requirements for the championships and the food served at Denny’s cafe is beyond delicious. Penny was a little tense in the initial go-round which resulted in her drawing her neck back and I couldn’t really push her on due to the lack of space and not wanting to ride up the back of anyone else, nor overtake while the judges were watching. In time, I hope to become more ring-savvy and show my horse off more rather than watching out for everyone else but having been on the other end of the ‘ring games’ I know how off-putting it can be. After a slightly strong judges ride, I decided that it would be good for Penny to have the probationary judge on her as well, who was riding each willing exhibit as well as the ride judge. To her credit, Penny was completely unfazed and gave a decent show which, although would not contribute to her final score, was pleasing to see. After each exhibit was ridden, we left the ring and took our saddles off for the strangest conformation section I have ever been a part of. One by one, we trotted our charges around the arena, almost as if we were in an in-hand class, before lining up and presenting individually for the separate conformation judge. Penny trotted out like a true little professional and did an OK stand until she was asked to move at which point she gave me her “how very dare you” look and stood so badly that I would have been impressed if I wasn’t so horrified. Knowing that her mark will have let her down, I decided to go ‘all or nothing’ for her individual show which made up 20% of the total marks and took place in the evening performance in our ‘glad rags’. Our set movements were pretty simple; a trot figure of 8, a canter serpentine, and a rein back. The order, the technicality, and any other movements were up to us. Urged on by one of the most respected and beloved stewards in AHS history, as well as mum who had reported back on the similarity of the order and placing of the movements in other classes, I knew that I had to try something pretty spectacular to keep the judge’s engaged. To show off Penny’s straightness, I walked and picked up trot directly going away from the judges, I then trotted my first half of the figure of 8 and cantered before the corner. I then went straight into my serpentine, starting with a canter-trot-canter on the first change or rein, and then a canter-walk-halt-rein back-canter on the second. I then extended up towards the judges, trotted my second half of the figure of 8 and straight up through the presentation flowers up the centre line to finish. Despite one or two slightly novice-y moments, I was delighted with how well Penny went and was thrilled with 18/20 for our show which put us into 4th place in an incredibly strong class with some encouraging feedback from both the ride and probationary judge. 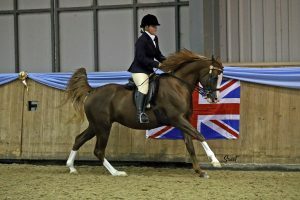 Penny had also qualified for one of the evening championships by being the highest placed 3 generations British Bred horse in the class. I trotted into the championship not expecting anything, we were against both ridden and in-hand pure bred Arabs and I was sure that the judges would cast their vote in a different direction. I was therefore delighted to be called forward as Reserve British Bred Champion and receive a rosette with tails so long that I was tripping over it when I dismounted and had to tuck into my pocket to stop it from tickling Penny’s sides! I have learnt so much while showing this year and I have so many people to thank, from judges whose feedback has pushed me in the right direction, to friends both new and old for their guidance and support, to Erica for her training and mentoring, and of course to mum for driving me and Penny from Addington to Aintree and everywhere in between! I can’t wait to see what 2019 holds and, after a winter of practicing and polishing, how different Penny will hopefully look. 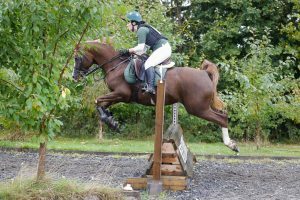 Although the showing for the year appears to be over, Penny is certainly not a one trick pony and has been out showjumping and arena eventing which she is delighted about. Having never jumped a course bigger than 65cm, I finally listened to her and took her to Lincomb’s all-weather eventer challenge in the 80cm class. After taking a couple of jumps to ‘get her eye in’, we flew around the course with no hesitations and it probably won’t be long until Penny’s carting me up the heights! Penny has once again had company on my jumping list as, much to my relief and delight, Odin – Avonbrook Odin (Marcus Aurelius x April) has been given the all clear to jump and treat as normal once more. We certainly need to get his fitness up before I try anything too taxing with him, but I am so thankful to be able to get him out jumping again since his stable injury in early July. Although it may take some time to get him back up to his usual heights (1.10 and 1.15 classes) as his confidence and happiness is my top priority, Odin really is a horse worth waiting for and, as I reassured him at the time of his injury, my love for him is unconditional and unwavering. It wouldn’t be a normal month at Avonbrook Stud without senior stallion Marcus Aurelius (Aurelian x Fiesta Magica) going to ‘parties’ just as much as his offspring. This month, Marcus’ big plan was to have me enter him for the 80cm unaffiliated ODE at Solihull around their BE track which would give me a chance to test drive my new Optimum Time cross country watch as well as perfect my long mane plaiting skills. After rolling as soon as he was off the lorry – just to make sure it wasn’t showing – Marcus warmed up like a just off the track ex-racehorse/kangaroo on sugar hybrid which wouldn’t have been so funny if he actually meant it. After attempting to goad the other horses into joining in, he pulled out a decent dressage test to put him well into contention going into the jumping phases. 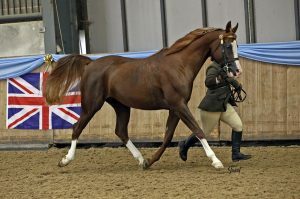 Upon leaving the arena, the dressage writer jumped out and proclaimed that she knew Marcus from his novice showing season in 2008 where he was lightly and very successfully shown before his HOYS year in 2010. I was initially surprised that she remembered him but then I realised that Marcus certainly isn’t forgettable and, luckily for me, stamps his progeny so I can still be looking into those intelligent brown eyes 50 years from now. By this point, his Lordship was feeling very pleased with himself and bounced around the showjumping for a cracking clear round to move us into 4th position going into his weakest phase, the cross country. Marcus is fast, Marcus is clever, Marcus is even very brave. Marcus, however, is a stallion of a certain age who likes to see what he’s jumping before he could potentially put himself or his rider in a dangerous or difficult situation. This is why I couldn’t be too cross at one silly stop where he just wanted to understand the fence and then jumped it beautifully on the second time of asking. It was the third fence and I wasn’t in my rhythm yet so, when galloping down the hill at it, I should have cruised past shouting ‘not presenting’ to give him a chance to see the landing side as well as get him more successfully back into a shorter, more energetic canter, but I wasn’t really thinking and I’ll freely admit that I wasn’t 100% convinced about the fence either which, on Marcus, is a clear round’s death sentence. In that respect, the stop was 100% my fault and I could hear Erica’s voice in my ear saying that, if I point at something, I have to mean it. 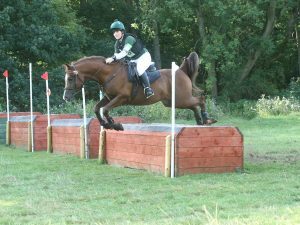 Ironically, all of the big questions on the course (ditches, trakehners, technical combinations and fence placements) proved to be no issue and, thanks to Marcus’ incredible turn of foot, we finished within the time allowed, a feat only a couple of combinations achieved in the class. Although I was a little frustrated to found out that we would have finished 2nd without the stop (and £50 richer), we still scraped into the placings in 9th which beat a double clear combination and was the highest of those with jumping faults cross country, so I was suitably impressed! Marcus rounded off the month by accompanying his son Robbie – Avonbrook Silver Eagle (ex Caveland Calypso) for a spot of early morning Autumn hunting which he thoroughly enjoyed. Robbie, at the age of 12, has seemingly decided to properly grow up and joined his father by being an exemplary hunter, even when the hounds were released while they were both on the lorry and were a little surprised by the hounds suddenly appearing. He has already improved drastically since our first hound exercise and is shaping up to be quite the bomb-proof mother’s ride. The end of September marked the start of my second year of University and my first time living in a shared student house in the surrounding neighbourhood. With the accessibility to on-street parking, I’ve been able to take my car with me which has given me the freedom and independence to take myself home on weekends without needing to comply to train times and connections. With also having friends with horses both in Alvechurch and Pinley, I’m never too far from a horse related fix during the week either! I will now be settling down into University routine again which should provide a more structured, weekend only fun during October. This coming month sees my first riding club competitions with Worcester and District RC, as well as hopefully an opportunity to get Odin moving slowly back up the heights in showjumping. Most excitingly, however, is my event horse in show pony clothing, Penny, who I hope will enjoy a more varied winter before making her return to the show ring next year.